The new MastMate Magic TC (Patent appl for) allows a single person to raise and lower the mast on their own simply, safely and quickly. MastMate Magic TC is a complete system and allows the user once arriving at the rigging point to get on the boat and step the mast, raise the mast and rig the boat for launching without having to get off the boat until everything is in place for launching. 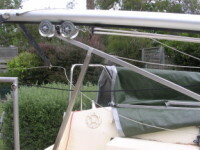 The system can be stowed on board or removed off the boat, raising the mast whilst on the water is no problem. Constructed of stainless steel. aluminium and using a bearinged wheel trolley car the product is light and strong.